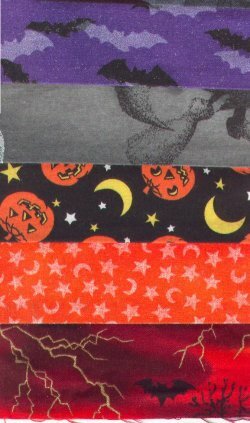 Back when Halloween was still around the corner, all the fabric stores had the most wonderful Halloween fabric in stock. Alas and alack, my munchkins are beyond the neat-Halloween-fabric-for-school-clothes that I used to make for them when they were in the lower elementary grades. It was with much regret that I passed the fabric by. 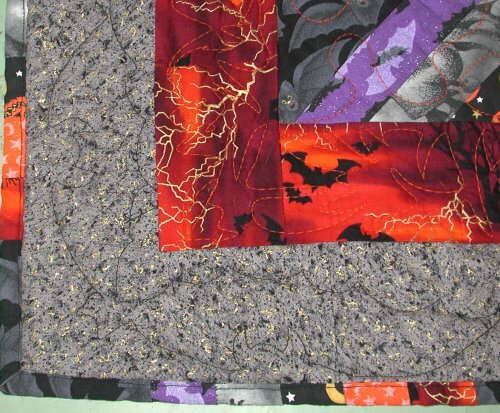 and a black tone-on-tone bat fabric for the other half of the square. 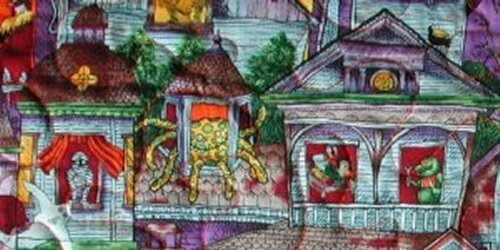 The inner border is the most FANTASTIC vibrant red background with gold metallic lightening strikes on it (seen as the last fabric in the vertical stripe, above). The outer border is a great mottled gray w/ metallic gold and black flecks running thru it. There are other scenes that I didn't take pictures of. 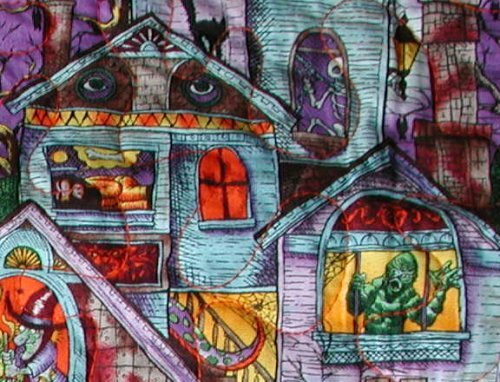 I loooooove this backing fabric! Following her directions faithfully, I was rather pleased to discover that the 'quilt in a day' name is not quite a misnomer ... relentlessly sewing, I was able to construct the entire top in one day. I further decided to indulge myself and for the second time in my life, I sent a quilt out to be professionally quilted. 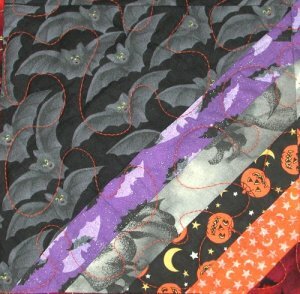 I asked on the Forum if anyone knew of any links that had bats, pumpkins, etc .. my idea was to use these as quilting designs somehow. Jody Sumrall (who I haven't seen lately) was nice enough to point me to a site that had the EXACT bats that I had in my mind's eye. 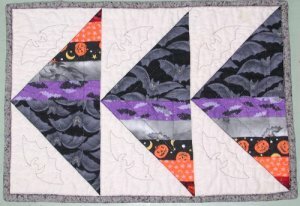 I printed off the bats and took them to the quilter. Eleanor Burns' method of constructing Roman Stripes (alternatively miscalled Roaming Stripes) is really kinda nifty. You sew a strip set of all the stripes you're going to have. Cut a strip of the black fabric exactly the same size as the striped strip set. Put them right sides together and seam on both long ends, resulting in a flat tube. 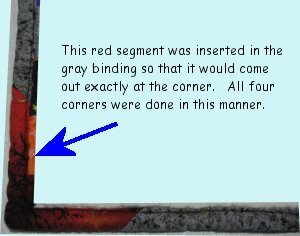 Now, using your 45 degree ruler, you cut half-square triangles, alternating the hypotenuse along either long seamed end. Release the few stitches at the pointed end and voila! you have a perfect half-square triangle block .... one half a triangle of black, the other half a triangle of stripes. Really, really nifty technique! Using this basic half-square triangle block, there are many layouts that can be created, forming very different looking quilts. The layout I chose results in diagonal lines, a technically more difficult layout to do nicely as all the seamlines should match for a pleasing diagonal line. Personally, I don't think it's all that difficult, but then I tend to be anally-retentive. 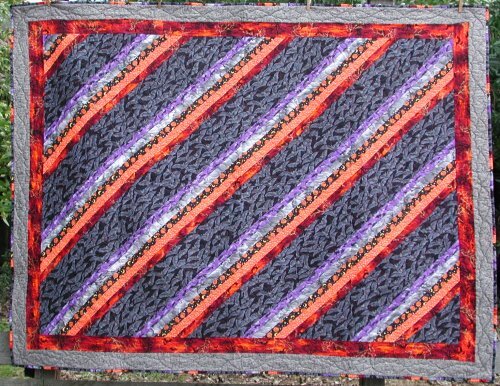 :-) If this were a Log Cabin quilt, this layout would be called "Straight Furrows". Other layouts don't require the striped seamlines to match, so they are less exacting to put together. The placemats are in the Flying Geese layout. 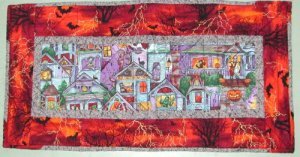 In my stash, I had some natural colored, homespun-sorta fabric that I used as the sky; the partial blocks were the geese. I had enough of the backing fabric to use on the 6 placemats, but when it came time to back the table runner, I only had a very, very small piece of the backing fabric left. So ..... I put some borders around the remnant and created a big enough piece to back the table runner. :-) I quilted the bat motif in peacock metallic thread in the natural colored fabric and stitched concentric triangles in the geese.